You may also like to read how to block the BBC News website Breaking News pop-up banner for all devices on your network, even when out and about. In my previous post I described how to get HTML5 videos (instead of flash videos) on the BBC News website. Here are some detailed instructions for how to do this in Firefox. 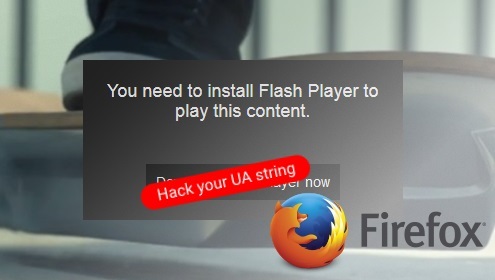 Chrome and IE both have built in flash players so there is no need for this hack. Firefox does not and I don’t want to install flash for security and annoyance reasons. There are a couple of ways to change your User Agent (UA) string. With about:config and with an extension. Enter the following into the address bar and ignore the dragons warning. You should now get HTML5 videos on the BBC News website. To remove this setting reset the parameter to clear its value. If you reload the preferences page you will find it has disappeared. Unfortunately Mozilla removed the feature that allows you to set this on a site by site basis. So this hack affects all domains and all sites will think your are a mobile visitor. This could cause some undesired behaviour on other sites so you may prefer to use an extension. User Agent Switcher does work but it’s a global setting affecting all sites. It’s easier than using about:config as it has a menu allowing easy toggling on and off. I haven’t found an extension which combines the best features of both these extensions. One that works but just for the BBC site. If you know of one then leave a comment. This doesn’t seem to be working in current Aurora, at least :-( I get “This content doesn’t seem to be working. Please try again later” for every video. This is setting the general.useragent.override pref directly. The native method above is still working for me on BBC News with Firefox 40 and 41. Working in latest Aurora dev edition (43) too. fwiw you can opt in to using html5 (beta) on iplayer, it does nothing for content on the website but it’ll at least contribute to giving the beeb a helping shove in the right direction. Yes, I’ve done that and the player works well. The link is http://www.bbc.co.uk/html5 but as you say it’s only for iPlayer, not news videos. You still need to pretend to be a mobile device for them. It looks like they may be slowly getting around to rolling it out further from the blog posts at http://www.bbc.co.uk/blogs/internet. Apologies for asking the question about Firefox a few minutes ago, James. As I mainly want to listen to Radio programs via the I-player, the link you provided above should work. It appears that the HTML5 beta test is only for the TV iPlayer and not the radio one. Hopefully they’ll roll it out further but I don’t expect this to happen quickly. You used to be able to use the radio station stream URL in other players such as VLC but these have been removed.